This gorgeous lace is very stylish featuring a beautiful floral design. Finished off with side sewn hem. The bottom hem features a scalloped edge, just lovely. 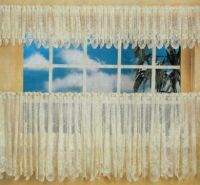 These curtains will add class and finesse to your residence. Beautify your home, investment property or buy them as a gift for your friends or loved ones. Quality you can count on. Ready and easy to hang simply slide the pole through the pocket at the top of your curtain - you just need the rod. You get: One panel of continuous patterned lace.